The cousin and close confident of former PASOK defence minister Akis Tsochatzopoulos, Mr. Nikos Zigras, apparently left the audience speechless on Wednesday when he revealed in court that there were times when he would hand over 100,000, or 150,000 Euros in cash PER WEEK to his cousin. Leaving everyone dumfounded, Zigras delivered a damning witness statement in the appeals court, in which he accused his own cousin (or Akis Tsochatzopoulos) of accepting bribes for the purchase of a Russian missile system and German-made submarines. Zigras pointed out that this money was being laundered via various offshore companies such as Torcaso, Bluebell and Nobilis that were created specifically for this purpose. Tsochatzopoulos of course denies all these claims. Later on, Zigras also said that former Cypriot Interior Minister Dinos Michailidis acted as a middleman in the arms sales. Because of this, Michailidis and his son are expected to be extradited from Cyprus to be questioned in Athens. 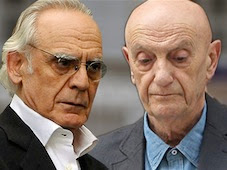 Zigras also claimed that the only reason Tsochatzopoulos paid for his cancer treatment at a German hospital was so that he would not die before he had time to tell him all the bank accounts that he had opened for him. “I apologize to you and the Greek people,” Zigras said as he concluded his statement.